Smok New Product Coming! 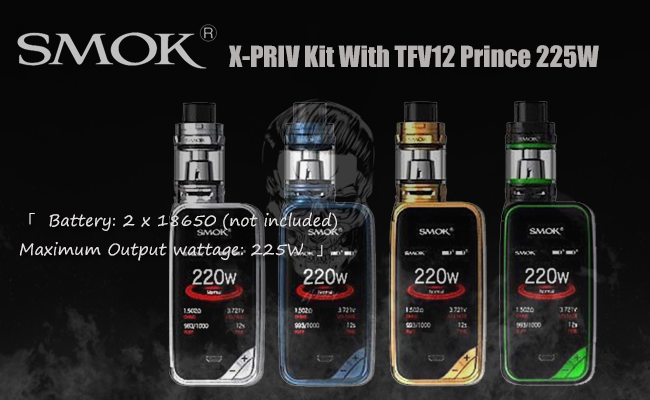 SMOK X-PRIV Kit & Mod! I know you are waiting for Smok new item, you can know it now, I really love this item, I hope you will have a same feeling with me. Firstly, I will let you know the mod! SMOK X-Priv TC Box Mod 225W has a deluxe appearance and a high-definition screen with glassy material. It has a well-designed UI which is more simple and intuitive than other products. What's more, its output power can up to 225W which can meet different demands of vapor chasers. SMOK X-PRIV Kit is a perfect combination of power and beauty. It is covered with glassy material at front, which can offer you a deluxe appearance and a high-definition screen. It employs newly designed UI, more simple and intuitive than other products. And its output power can up to 225W which can meet different demands of vapor chasers.